PagerDuty was founded in 2009 by 3 former Amazon engineers who were often on-call. To engineers, being on call means carrying a pager to respond to crises when software breaks or services go down. In the 10 years since that day, PagerDuty has built an exceptional business. Their product has evolved from on-call management, which includes routing calls, triaging alerts, and creating workflows to handle crises in real time; to an incident management platform that manages the standard operating procedures for responding to crises; to real-time operations dashboards that provide visibility and health scores for infrastructure. On Friday, the company published its S-1 and revealed to the world a very strong business. the company generated $107M of trailing 12 month revenue, services 33% of the Fortune 500, grew revenue at 48% and has a net retention rate of 139% across 10,800 customers. The average customer is worth about $10,000. Let’s compare PagerDuty to other recent software IPOs for companies selling to engineers at their IPO. Let’s first look at one of the key SaaS metrics: the dollar retention. This is the value of a cohort a year later inclusive of churn and expansion. 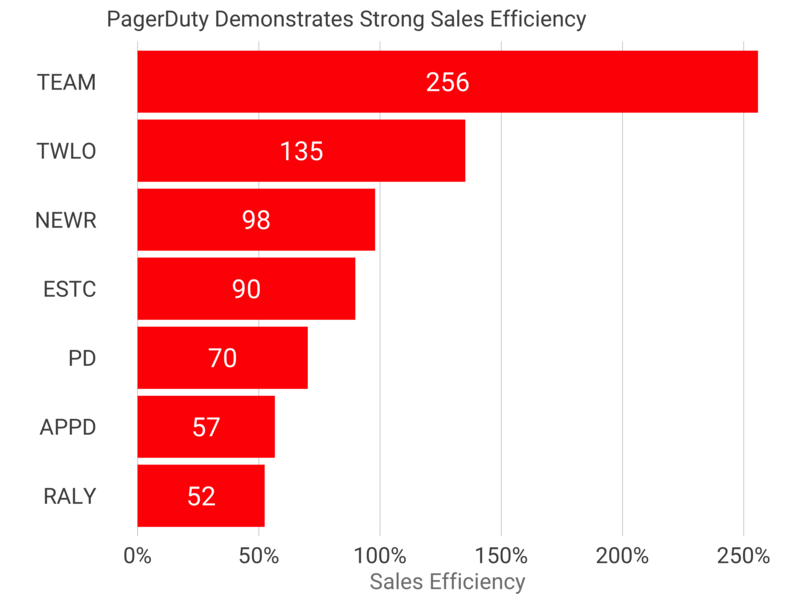 PagerDuty is at 139%, which puts it smack in the midst of an exceptional group. According to the recent Redpoint free trial survey, the 140% net retention puts the business in the top decile of businesses. Next, let’s compare the sales efficiency. Sales efficiency is a measure of the marginal gross profit generated by a dollar invested in sales and marketing. Here we can see that Atlassian is off the charts, with their super-efficient market model. 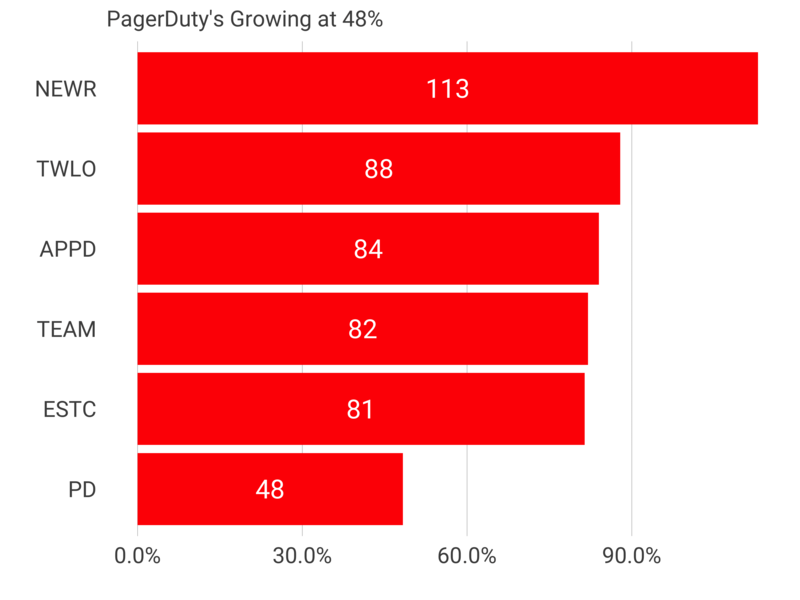 PagerDuty is again right in the midst of everyone else at 70%. 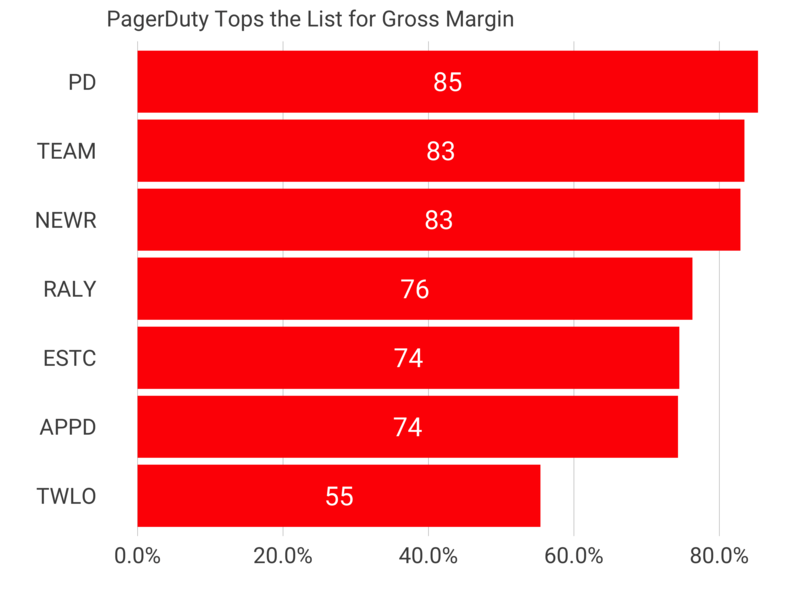 Looking at gross margin, which is the revenue minus the cost of goods sold (typically hosting costs and customers success), PagerDuty tops the list of 85%. This is substantially above the publicly traded median of 71%, Which again reinforces a very capital efficient go to market. In terms of price point, PagerDuty is right around the $10,000 revenue per customer per year. In the last year, the number of customers generating more than $100,000 per year in revenue nearly doubled to 203 from 132 the period before. This is likely due to a combination of moving upmarket and also the terrific account expansion. A typical account starting at $10,000 will exceed $100,000 in seven years at today’s NDR. In terms of revenue growth at IPO, PagerDuty is on the lower end of this exceptional group, but the combination of the terrific NDR and very capital efficient sales and marketing means PagerDuty will continue to be a very successful business. Congratulations to the PagerDuty team on building an impressive business. 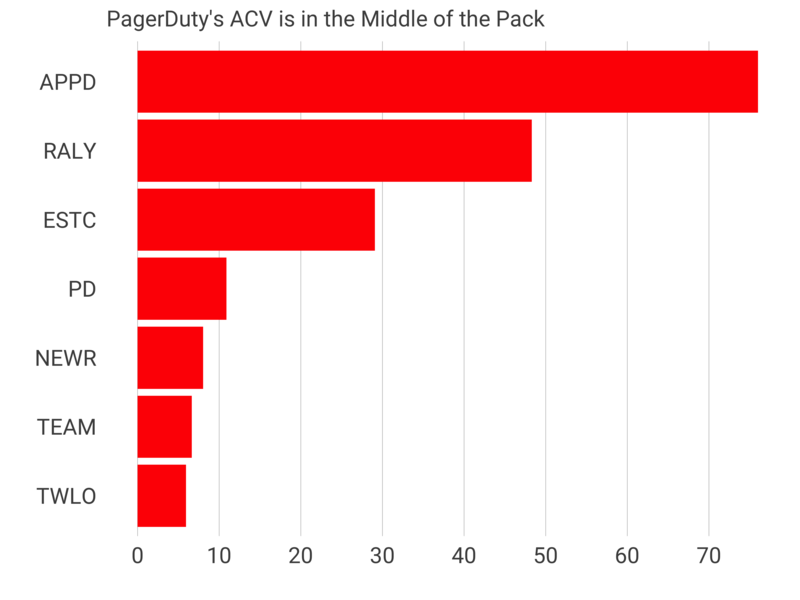 Comparing the metrics to other world-class companies, we can see that PagerDuty’s metrics are clearly the top decile, and represent another fantastic software IPO. *This post has an updated sales efficiency chart. The previous reported Twilio’s sales efficiency incorrectly.